When you think about the Statue of Liberty have you ever thought how wonderful it must have been to see for someone who'd been at sea on an overcrowded ship for weeks? Her torch would stand tall, through most of the 1800's it would glow in the fog and the night, acting as an actual torch. The Statue not only stands for liberty but for knowledge and a literal safe harbor. Does your child feel the urge to stand up for what's right? Does she often think about those huddled masses, pulling into the New York Harbor of early America? Does she get patriotic to the max from every national holiday from the 4th of July to Veteran's Day? 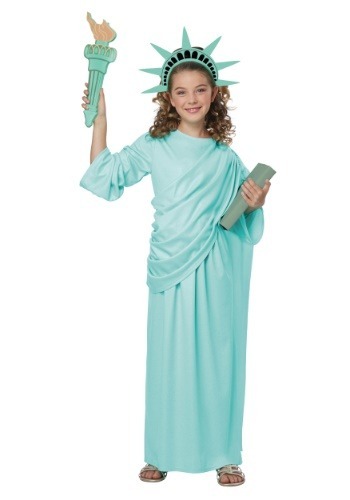 This beautiful Lady Liberty ensemble is perfect for your little politician or historian. In this costume, she'll be instantly recognizable as the statue that has stood for freedom and knowledge since 1882. The costume comes with a lightweight torch, though she will be in no way obligated to keep the torch in the air for longer than it takes to snap some great photos. She'll love her new look as she proudly wears the crown and the graceful dress, you'll just have to be sure she's not ushering any poor, tired masses back your house after her costumed event. Whether she's in a school play, in a 4th of July parade, or has patriotic plans for Halloween trick-or-treating, Lady Liberty is sure to add a special glow to any event.